Colorado has a number of haunted locations. One, the Stanley Hotel, is considered one of the top haunted locations in the United States. It served as the location for one of the most famous films based on a Stephen King novel, The Shining. Ghost sightings and hauntings are also often reported in a number of other places in Colorado. Sure you've heard of the Stanley as a haunted hotel in Colorado, but less attention is given to its second most haunted hotel, the Hotel Jerome in Aspen. Jerome B. Wheeler (president of Macy's department store) financed the hotel, which opened in 1889 as a luxury hotel with rooms costing a princely $3 per night. Silver went bust in 1894, and the hotel struggled until the end of World War I. It underwent a series of renovations and revivals throughout its history, closing occasionally and seeing multiple owners. Today it operates as a luxury hotel in Aspen, known as much for its storied history as its luxurious accommodations. Hotel Jerome guests have reported numerous apparitions, including one of a young boy who reportedly drowned in the hotel's pool. The apparition disappears, leaving only a wet patch on the carpet. Other guests report hearing a man sobbing and seeing him walking the halls. Stories suggest the man is a silver prospector named Henry O'Callister, who mourns the loss of his love. Apparently, the hotel's maids also have some ghostly help, as a spirit is said to turn down beds. The Hotel Jerome is one of the stops on the Aspen Dark Side Tour, a walking tour of some of the town's haunted locations, that runs from June through September. You can visit the Hotel Jerome on the Aspen Dark Side Tour, soak up the atmosphere as you dine in its Prospect Restaurant (a typical dinner entrée will set you back about $38), or stay in one of its 90+ guest rooms. Rooms start at about $450 per night and go up to around $1,800 for the presidential suite. The Jerome is located at 330 East Main Street in Aspen. 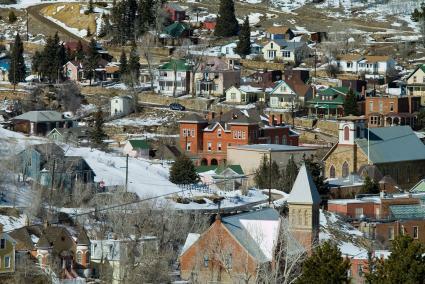 Located in Clear Creek County, Georgetown is a historic town established in 1859 during the Pike's Peak Gold Rush as a mining camp. With just over 1,000 residents in 1.1 square miles, Georgetown has its fair share of reported hauntings, many stemming from the plethora of historic protected buildings within its borders. For the small size of the town, a surprisingly large percentage of it is reported to be haunted. Places where hauntings have been reported include the Hamill House Museum, where visitors report an apparition in a Victorian dress; the Hotel de Paris Museum, where staff and guests have reported sightings of apparitions; and the Rose Street Bed and Breakfast, where guests hear disembodied sobbing and report seeing the apparition of a woman. Silver Queen Walking Tours takes guests through the town's many reported haunts. They offer a ghost hunt at the Rose Street Bed and Breakfast, where you can also book a night in one of four guest rooms. You'll find the Rose Street Bed and Breakfast at 200 Rose Street in Georgetown. 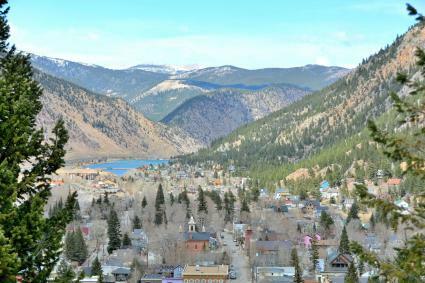 While you're in the area, check out nearby Gilpin County (it's about 30 miles away), which has its own fair share of hauntings associated with its mining and gambling history, including Central City and Black Hawk. In Central City, visit the Central City Masonic Cemetery, where visitors report seeing a woman in a black dress; the Teller House, home to a mysterious oil painting in the floor that is said to whisper; and the Old Opera House, which is believed to be haunted by at least three ghosts. When is a cemetery not a cemetery? When it falls into neglect and the bodies remain, but the headstones are removed and the land is reclaimed as a public park. 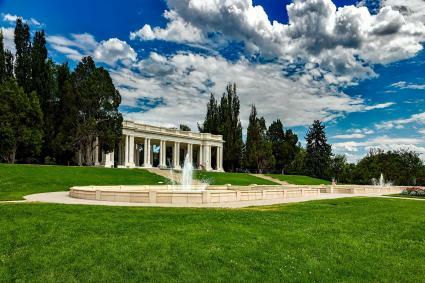 That's the story of Denver's Cheesman Park, located in the city's Capitol Hill neighborhood. The popular park may have as many as 2,000 bodies still buried under its lush greenery. Visitors to the park and residents in surrounding homes report a number of spooky occurrences, such as knocks on the door when nobody is there, feelings of dread and sadness, and sightings of wandering shadow figures. The park is open from dawn until 11 p.m. daily. It's located at Franklin and 8th Streets in Denver's Capitol Hill neighborhood. It may have been growing up in a Colorado haunted house that got Carolyn Masuoka started as a paranormal investigator with White Light Paranormal Insight in the Portland, Oregon metropolitan area. She grew up in Colorado Springs in the Old Stockbridge House, located in Old Colorado City. At the time, the house was the Amarillo Motel. Carolyn says, "It was the site of the first log cabin in all of the Colorado territory. The house was rebuilt as a three-story block building, with 18-foot tall ceilings and 3-foot thick walls. The fireplace pulled out from the wall to escape into underground tunnels for both nefarious purposes and to escape Indian attacks." According to Carolyn, she heard footsteps in the hallway from the room she slept in every night at the same time. She notes you couldn't hear it from any other rooms in the building or anywhere else on the same floor; it was just from her room. Her grandfather had experiences there, as well. Carolyn states, "My grandfather had several people come visit him there after they died, such as the old doctor whose clinic was right across the street and who delivered me. Just before we knew officially he had passed, he showed up within minutes of the time he died." Carolyn also reports scary encounters with an old hag. The house served as a motel in the 2000s, although it's difficult to tell if it is operating as one now (there's no website, but it is in the yellow pages). It may be a private home. It is on the National Register of Historic Places, and you can walk or drive by. Please don't trespass if it is a private residence or no longer in operation. 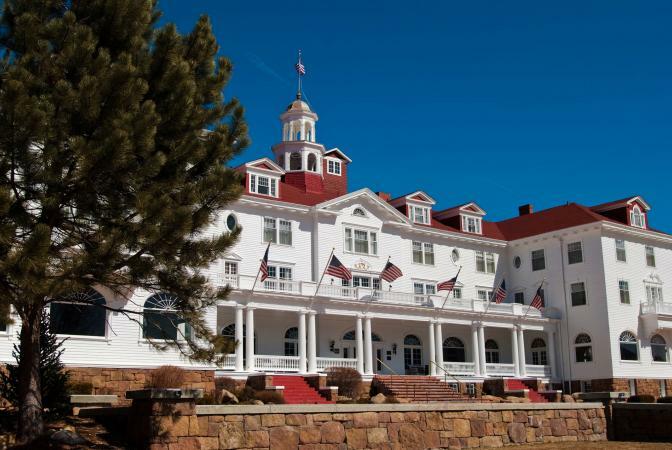 While the Stanley Hotel is a significant haunted location in Colorado and the state's most well-known haunt, it isn't the only one. From the old mining towns to the heart of its largest city, Colorado boasts plenty of ghosts for avid adventurers to find if they know where to look.